Taylor led the nation in punt return average (20.3 on 26 returns) and touchdowns (4) in 1969 and, combined with outstanding play in the defensive backfield, was selected as the team’s MVP after Boston University went 9-1. He was the first defensive back taken in the ’70 NFL draft when chosen by the 49ers in the first round (17th overall) and moved into the starting lineup at cornerback, across from All-Pro Jimmy Johnson. 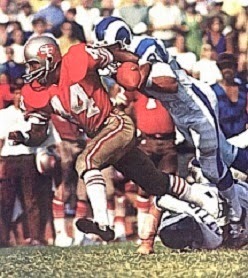 Taylor improved as the season progressed and made a notable impression as a punt returner, which had been an area of weakness for the 49ers in 1969. 49ers went 10-3-1 to finish first in the NFC West. Won NFC Divisional playoff over Minnesota Vikings (17-14). Lost NFC Championship to Dallas Cowboys (17-10). Taylor was nagged by a shoulder injury during 1971, but was named to the Pro Bowl as he intercepted another three passes and continued to improve although his average dipped to 6.9 on a league-leading 34 punt returns. He remained in the starting lineup until 1977, a total of eight years, and intercepted a career-high 6 passes in ’73, when he also led the NFL with a 13.8 average on 15 punt returns. Released during the 1978 preseason, an attempt to catch on with the Oakland Raiders failed and Taylor retired. Overall, he intercepted 18 passes, recovered 10 fumbles, and averaged 9.3 yards on 142 punt returns, and was selected to the Pro Bowl once.